Before we get into February and 2015 becomes a distant memory, I wanted to take some time and do a little recap of last year. I launched my website to the public on February 22, 2015 with my post Welcome to FixThisBuildThat.com. I ended up doing 38 more posts in 2015 giving you projects, plans, and tools (I guess I stayed true to my mission). And before I get into the top posts, I just wanted to say a thank you to all of you for coming to my site and supporting what I do. In 2016 I plan to bring you even more of what you got last year plus some new surprises along the way, like my entry into the YouTube at the beginning of the year. So stay tuned and let’s build something awesome together! Make sure to follow me on Instagram, Facebook, YouTube and Pinterest to keep up with all my latest builds and free projects! Okay, now let’s get to the good stuff. 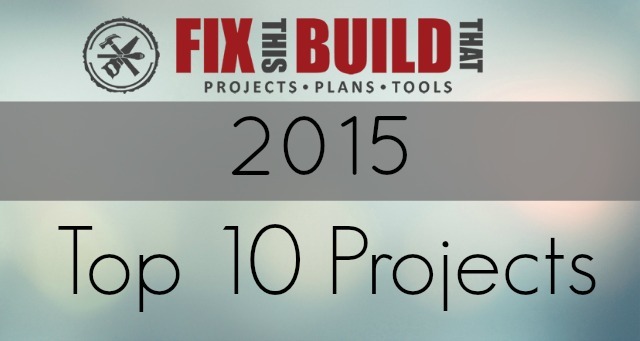 Here are the top 10 projects from 2015 based on my Google Analytics. 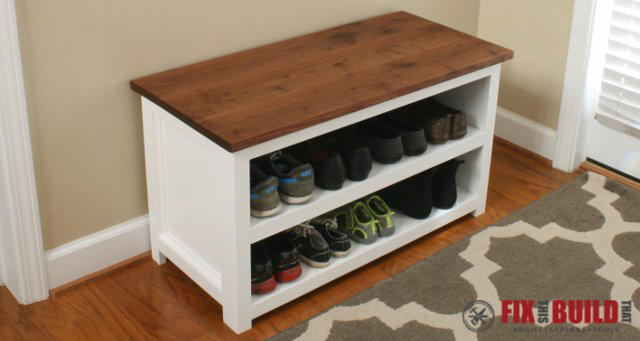 The Adjustable Shoe Storage Bench was my most popular build of 2015. It was my first furniture build with full plans and it was actually part of a giveaway promotion I did. So unfortunately I don’t have it anymore…maybe I should build another, because the storage on this thing is amazing! Number 2 is a shop project that really took off. 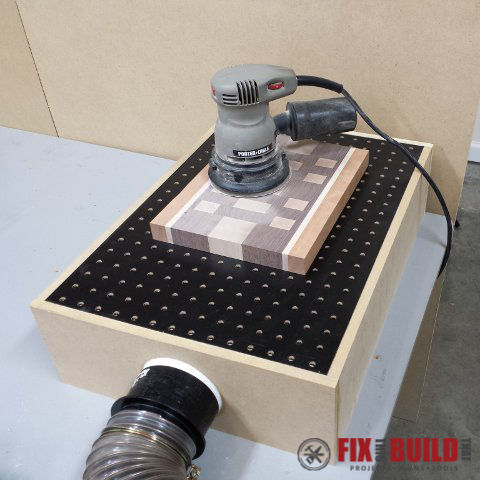 The Downdraft Sanding Table Box got featured on several sites and has really taken off on Pinterest as well. It’s a great addition to your shop to help keep dust down while sanding and can be hooked up to a dust collector or shop vac. Best of all I made it completely from scraps (this might become a theme later). Up next is the Mobile Pallet Wood Storage project. I actually built this project back in 2014 and only had mediocre cellphone pics of it. But the build pics looked pretty decent since I had the shop door open, so I posted it. And people loved it! 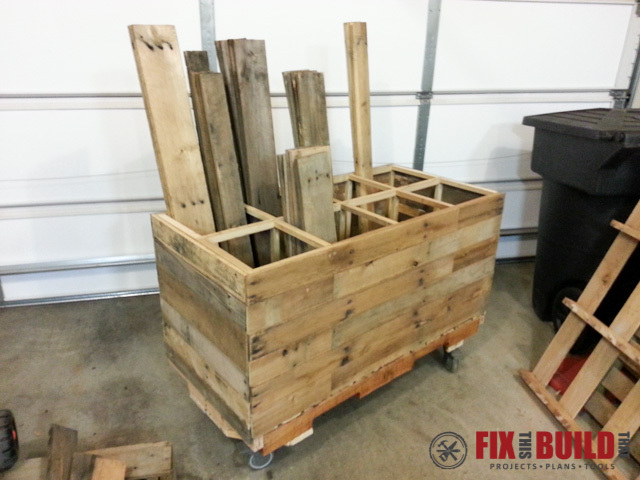 It’s made completely out of…wait for it…pallets. Duh. It is 4′ x 2′ and holds a ton of wood. 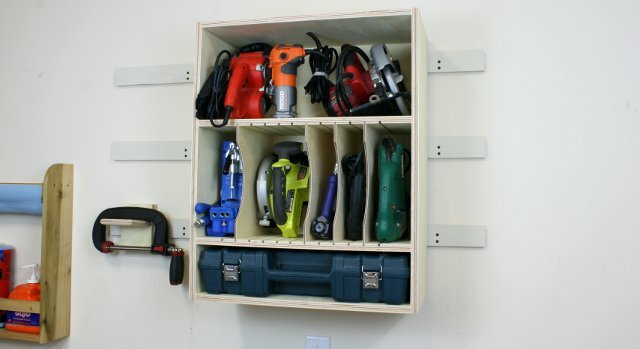 Great project to organize the wood in your shop. 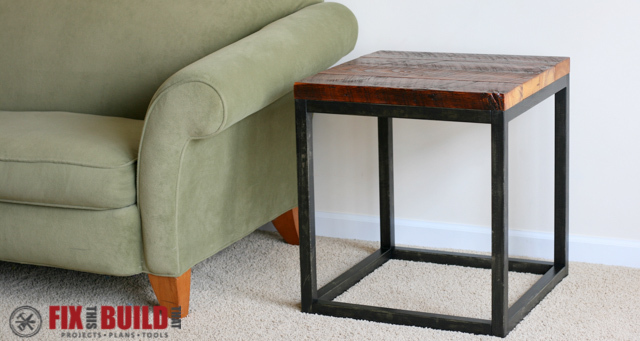 The Reclaimed Industrial Side Table was one of my favorite pieces I built last year. I love the top which is reclaimed ceiling joists from a 90 year old house in East Nashville. There is just so much character to the top and I went for a faux metal look on the base (those are wooden 2×2’s not metal legs!). The best part about this build is that it’s dead simple and would be a great first project. 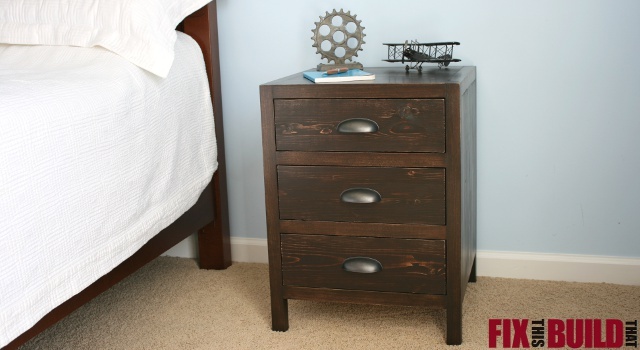 This DIY 3 Drawer Nightstand is made to resemble the Printmaker style. It has clean lines and for a very modern feel and people really loved it. I’ve had several folks send me their completed project and they look great. Number 6 is my Cordless Drill Charging Center. 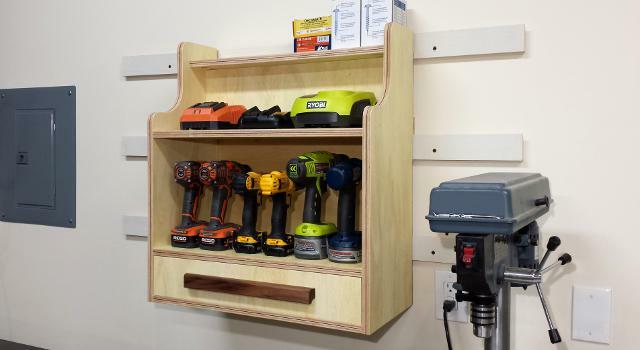 This was a modification of a plan from Jay Bates and it has been an awesome storage spot for my ever growing collection of drills. The drawer I added has come up spades as I store all my bits there and always know where to go to get them. 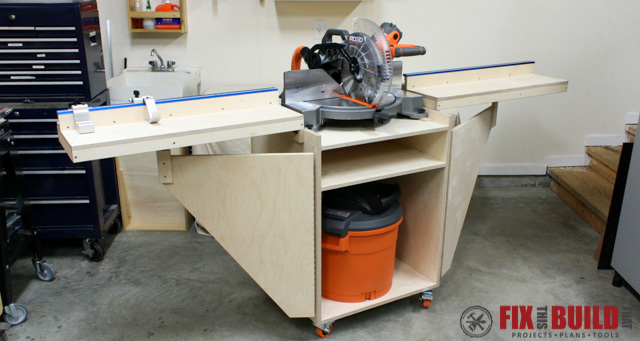 The Mobile Miter Saw Station was a build I’d been wanting to do for a long time. I had the pleasure of partnering up with RIDGID on this one and it turned out to be an even better project than I had imagined after I added the dust collection and all the trimmings on the saw. I use this guy all the time now and when it’s not in use I can store it out of the way. Best of both worlds! 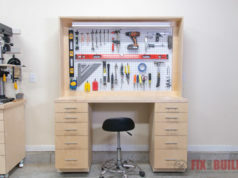 The Tool Storage Wall Cabinet was another shop organization build I did early on. I built the cabinet out of a half sheet of plywood and it holds a lot of my miscellaneous corded and pneumatic power tools. These days what it holds has changed a bit and the modular dividers in the middle are great because I can just move them to fit the new tools I put there. 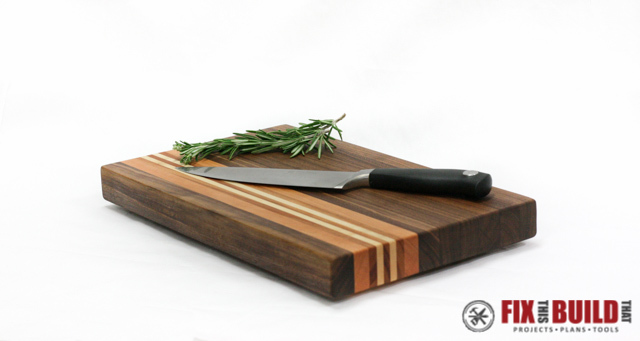 Last and certainly not least on the top 10 list is How to Make a Cutting Board from Scrap Wood. 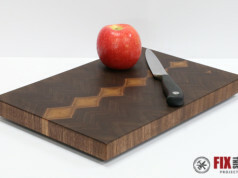 I’ve been making cutting boards for some time now and I even sell a few of them in my Etsy Shop. In this post I walk through my whole process using some offcut scraps that I got from a local shop. 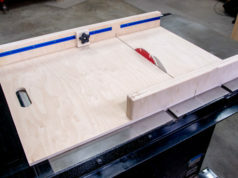 Making a cutting board is somewhat of a rite of passage for woodworker’s and I hope you can take some tips from my post and apply them to your own build! Well that’s it! It was fun making this list of my Top 10 projects from 2015. It’s always nice to look back on what you’ve accomplished and remember some of the pain and struggles it took to get them all done. I definitely learn new lessons in woodworking and mainly what NOT to do on each project. 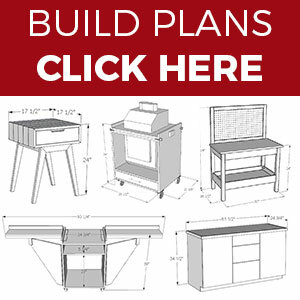 I hope this list has inspired you to build one (or more!) of my projects. Anybody can get into woodworking, and even though I have a lot of tools right now, I started out just like everyone else. If you have a desire to build, then you can do it. And I’m here to help you! Tell me which project you liked the best or one that didn’t make the list. And if you’ve made one of these projects share a picture of it in the comments below! Let’s get out there and build something awesome in 2016!